Artist Michael Murphy of Milledgeville, GA want’s to get the conversation about gun control going. On display at the Association for Visual Arts (AVA) in Chattanooga TN until the end of June. Full story and details over at the Times Free Press. Like most gun related art, the intended purpose of this is to get people to complain about how “guns kill people” and how we should ban them. I’m obviously not for that, but I would like this badass installation in the foyer of my ENDO mansion someday. Sadly the nature of pingpong balls means they will blow around a lot in the breeze I’ll be getting off the ocean. Michael Murphy and I will have to figure something out… maybe platinum balls painted black just to make people mad? Lots more pictures on Michael Murphy‘s website. Brass Balls, for ultimate bragging. Different caliber bullets and cannonballs for the win. 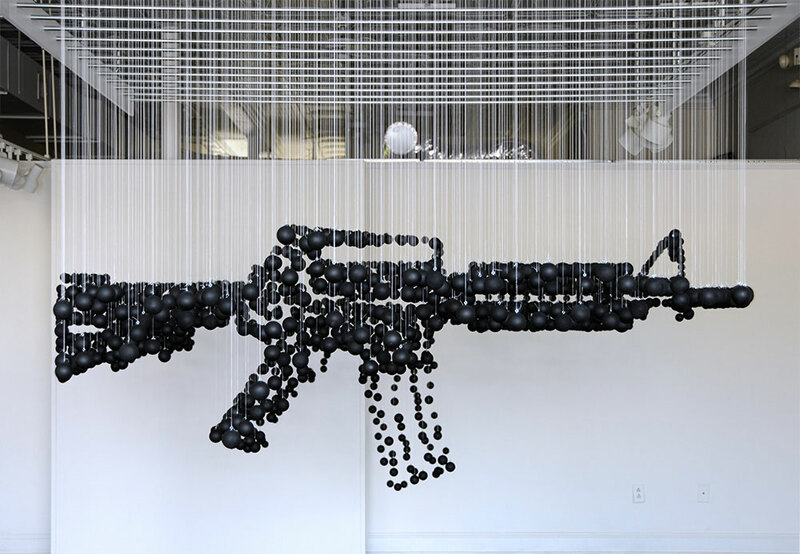 Yet another artist “Using the iconography of firearms to protest gun violence”. Creative piece, not creative idea. Pretty amazing… But, too much time on your hands, bro! How about re-directing that creativity into selling our Politicians on some real gun-violence legislation? Oh my! This striking image has shown me the true cost of my so called rights! I’m partly responsible for the loss of brazilloins of lives! I’m just a cog in the military industrial complex! Can I ever be forgiven!!!! No but really, what this reminds me of is all the money that I spend on these damn things! I need to sell some of this crap and pay off my credit cards. Anybody want to buy a Civil War era musket? Anybody?